« Let’s all welcome the new kid! 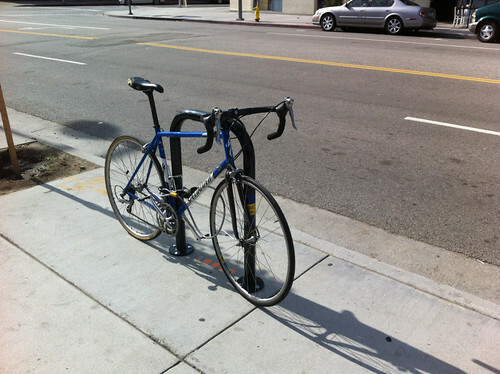 As we’re sure much of you know, bicycle theft has become a pretty hot issue for the LA bicycle community. For our part, we can’t blame them for getting riled up. The latest reports from the LAPD, via the LA Times, state that bicycle theft has increased 29% in Los Angeles in the past year – a number that is probably a large underestimate. 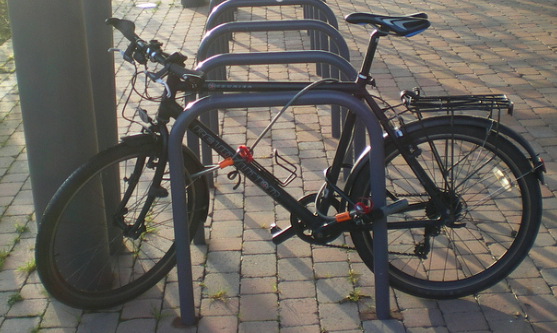 Most bicycle thefts remain unreported. 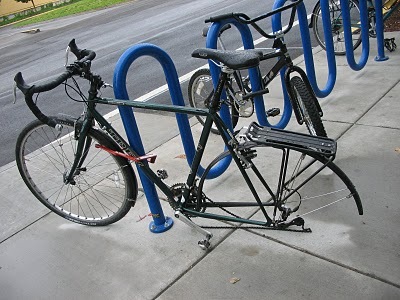 Bicycles have become a hot item for theft. A lightweight bicycle that could be worth hundreds of dollars is a pretty tempting target. In a weird way, this safety crisis is an indicator of just how popular bicycling has become in our City. There are more bikes on the road, more bicyclists in the streets, and more people who want to get a bicycle of their own. These bikes wouldn’t be getting stolen if they weren’t prevalent and in high demand. This rise in theft has prompted some in the bicycle community towards vigilante action against bike thieves. We won’t be getting into vigilantism today (ed. Not gonna touch that with a 10 ft. pole!) but we thought it might be a good idea to go over the best way to foil would-be bike thieves: proper parking. We want to make sure your bike is secure, so let’s do a little rundown on how to keep your bike as safe as possible, shall we? One of the best ways to secure your bike from being stolen is to lock your bike – no matter how little time you think you will be away from it. Don’t give a would-be bike thief a head start. Park your bike in a good location with a good lock, and make sure to lock up properly. Make sure to take your bike accessories with you when leaving your bike. In the event that your bike is stolen, make sure you have a plan to identify it or track it. If you’re prepared, you’ll have a much better chance at getting your bike back. First and foremost: you’ve gotta have a good lock. There are a lot of locks out there to choose from, and it can be a little confusing for those new to bicycling. We tend to trust the u-shaped locks over cable or chain locks for their added strength; some bike thieves can find cables and chains relatively easy to cut, but good quality U-locks are the most difficult to break. In high theft areas, plan on using more than one lock (an additional U-lock or an additional lock and cable). No lock is totally secure, so buy the best you can. If some locks seem too expensive, just remember: a great lock is a whole lot cheaper than buying a new bike. There needs to be bike racks on all city block, preferably in well-lit areas with security cams and signs posted which state: “You are being photographed.” To detour bike thieves. Is health care and road maintenance bankrupting the city of LA? This man cycles to work 365 days of the year, never misses a day of work and has lost 50 pounds of excess fat in the last two years of commuting by bike. Thanks for this entry, Chris! So at UCLA Transportation, I’m co-managing a group of students who are a part of an Action Research Team focused on improving the biking experience for students for two quarters. One of their recommendations to my department was to educate students more on bikes, especially on safety (for themselves, AND their bikes). So, in time for Earth Day, we’ll be releasing at least one video produced by the students, focused on how well students are locking up their bikes (picture me, as a mother, hand on forehead, saying “OY!”) and how to actually how to lock up a bike properly. Picture Hal Grades Bikes: UCLA edition. It should be good, and hopefully you’ll decide it merits sharing here! I’ve avoided the need to carry extra locks for my wheels by installing locking skewers (as opposed to quick-release of bolt skewers). These skewers require a special key to remove the wheels. I use one made by Pinhead – the set comes with front and rear skewers plus a locking bolt for your seat post. The key works as wrench to remove the wheels and fits on my key chain. I think they cost about $50 or so – worth it for not needing to lock your frame and your wheel. Any thought on requiring a larger number of bike racks or lockers in parking structures or high-rise buildings, rather than having the bike parked on the street for 6-8 hours? 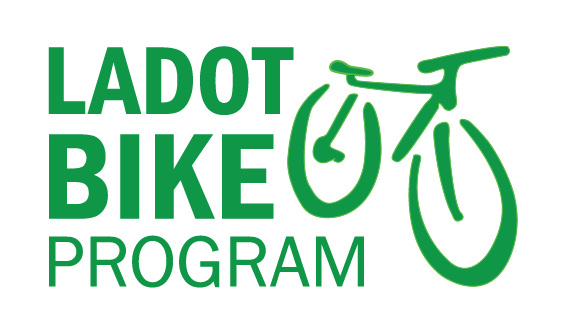 I realize that gets out of the LADOT and into municipal code, but thought I would mention it. The city council proposed a motion directing city planning to study bicycle parking requirements for new multi-family developments. We hope it gains traction. What about bike racks as a regular feature at bus stops? A lot of us bike to bus. Fascinating film about getting women to ride bikes, the German version of our DOT sets a new standard that UK and AU are modeling with much sucess. on April 23, 2013 at 3:40 pm | Reply 511 Contra Costa » How Do You Lock Up?